The crankcase breather, also commonly referred to as the PVC valve, is one of the first things to check if your lawnmower is not operating properly. The crankcase breather traps gasses that escape during combustion, relieving pressure and reducing buildup of corrosive material on the engine system. 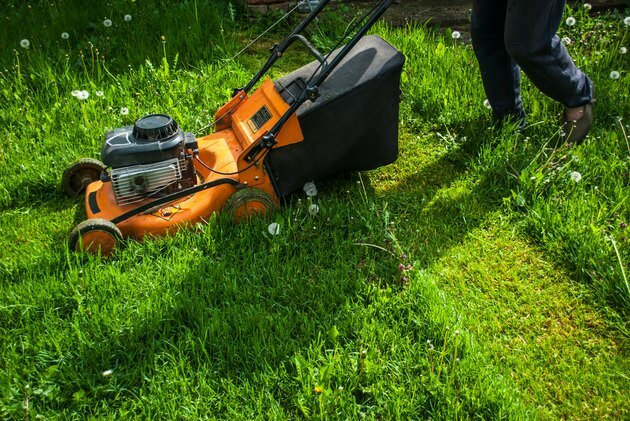 Knowing how to spot a dirty, clogged or failing crankcase breather early can help keep your engine from seizing or additional damage being done to your mower. The crankcase breather is generally mounted on the exterior of the engine case, often with a small "cage" around it to protect it but still allow access. Briggs & Stratton lawnmowers will typically have the breather mounted near the rear of the engine, but other makes may have the breather mounted on the right or left side or even at the front of the engine. Oil leaks are the most common symptom of a defective lawnmower crankcase breather. Over time, filters may become clogged with dust and other debris, which restricts airflow and allows pressure to build. This leads to blown seals and gaskets, causing oil leaks. After cleaning the crankcase breather, the blown seal or gasket will have to be located and replaced before use of the mower is resumed. White or blue smoke coming from the exhaust pipe is a strong indicator that the crankcase breather is clogged. Thick black smoke usually indicates the problem is more advanced, and built-up pressure is forcing oil into the cylinder where it burns off and sends black smoke through the exhaust. If your lawnmower is exhibiting this symptom, cleaning the breather to remove clogs or buildup usually corrects the problem. If the crankcase breather is not working correctly, it can cause damage to other parts of the engine. Seals and pistons are susceptible to faster wear and tear when pressure is increased. If you have to constantly replace these items, it's probably time to clean the crankcase breather. A sluggish engine is another sign that a crankcase breather is not working correctly. A clogged breather can cause vacuum leaks, leading to an incorrect air-fuel ratio. You will notice a decrease in overall power and acceleration, particularly at low engine speeds. If uncorrected, this problem can lead to a buildup of corrosive acid, which can damage the entire engine and cause a complete loss of engine power. Several of these issues can have other causes, but cleaning the crankcase breather or replacing the PVC valve is a fast, inexpensive and easy repair. So it's a good first step to resolving problems without tearing down the engine.